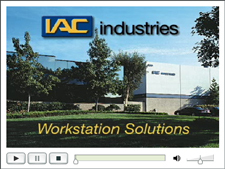 IAC workbenches are engineered and manufactured in Brea, California. IAC workbenches are engineered and manufactured in Brea, California. Our ability in custom engineering allows IAC to provide specialty designs for customers with special application needs. This is where the workbenches literally take shape. Cut, bend, press and form. We do it all right here. This is where we turn on the heat. Much of the superior strength found in IAC industrial workbenches is a product of our quality welding. Durability is a hallmark of IAC industrial workbenches. IAC operates its own inhouse Powder Coat application and baking process. Powder coating is more chip and scratch resistant than normal paints, and is baked on like a ceramic to provide superior adhesion to the metal. Deceptively simple, the worksurface is actually the product of a great number of manufacturing steps. Each step carefully accomplished to provide the greatest user experience and satisfaction. This is where IAC industrial workbenches and workstations begin to take shape. IAC takes care that customers receive all the hardware needed to assemble the final products. Here you'll see IAC's special kitting team responsible for preparing these hardware packages. One of the most important aspects IAC quality is the care we take in packaging our products for shipping. We put as much effort and care into this process as we do in any other aspect of our manufacturing. A quick review of the processes and products that make up our mission at IAC Industries. Thanks for visiting!